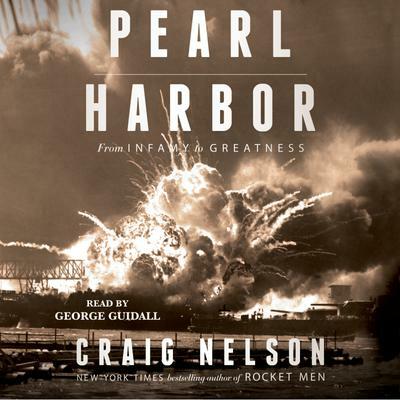 Published in time for the 75th anniversary, a gripping and definitive account of the event that changed twentieth-century America—Pearl Harbor—based on years of research and new information uncovered by a New York Times bestselling author. The America we live in today was born, not on July 4, 1776, but on December 7, 1941, when almost four hundred Japanese planes attacked the US Pacific fleet, killing 2,400 men and sinking or damaging sixteen ships. In Pearl Harbor: From Infamy to Greatness, Nelson follows, moment by moment, the sailors, soldiers, pilots, admirals, generals, emperors, and presidents, all starting with a pre-polio Assistant Secretary of the Navy, Franklin D. Roosevelt, attending the laying of the keel at the Brooklyn Navy Yard of the USS Arizona, against the backdrop of the imperial, military, and civilian leaders of Japan lurching into ultranationalist fascism, all culminating into an insanely daring scheme to shock the Allies with a technologically-revolutionary mission in one of the boldest military stories ever told—one with consequences that continue to echo in our lives today. Besides the little understood history of how and why Japan attacked America, we can hear the abandoned record player endlessly repeating “Sunrise Serenade” as the Japanese bombs hit the deck of the California, we feel terror as Navy wives, helped by their Japanese maids, upturn couches for cover and hide with their children in caves from a rumored invasion, and we understand the mix of frustration and triumph as a lone American teenager shoots down a Japanese bomber. Backed by a research team’s five years of efforts with archives and interviews producing nearly a million pages of documents, as well as a thorough re-examination of the original evidence produced by federal investigators, this definitive history provides a blow-by-blow account from both the Japanese and American perspectives and is a historical drama on the greatest scale. Nelson delivers all the terror, chaos, violence, tragedy, and heroism of the attack in stunning detail, and offers surprising conclusions about the tragedy’s unforeseen and resonant consequences.